I want to thank my family and friends for helping me make my decision. I have officially decided to enter my name into the 2014 NBA Draft. Bhullar, who was named the 2013 and 2014 Western Athletic Conference Tournament MVP and led the league in blocks (3.37/game) and shooting percentage (64.8), had two years of eligibility left with NM State. Helping his team reach the NCAA Tournament each year he was with NM State, Bhullar averaged 10.2 points and 7.2 rebounds per game in 65 games played. Bhullar helped the Aggies to two consecutive WAC Tournament titles during his time in the Crimson and White and finished his career with the top two spots in the record books for blocks in a season as he had 85 blocks as a freshman and 101 blocks as a sophomore. Before Bhullar broke the single-season record, former Aggie Ronald Grant held the record with 58 blocks during the 1973-74 season. Menzies knows exactly what kind of player he had on his team during the past two seasons. Bhullar helped the team to a 50-21 record over the past two years for a 70.4 winning percentage. He was named to the WAC all-defensive team in 2014 and was the Newcomer of the Year in 2013. Bhullar also broke the school record for blocks in a single game when he tallied 10 blocked shots in a 91-60 win over Prairie View A&M, Nov. 27 in the Pan American Center. That day the Aggies tallied 14 blocks as a team, which is also a new school record at NM State. Former Aggie All-American James Moore is the previous record holder for blocks in a game when he tallied eight blocks against North Texas on Feb. 7, 2004. The previous school record for blocked shots by an Aggie team was 12. NM State marked 12 blocks against Creighton, Jan. 12, 1978, and against UTSA, Feb. 2, 2013. The 2014 NBA Draft is scheduled for Thursday, June 26 at 7 p.m. (ET) with coverage on ESPN. There are two rounds in the draft with 60 players being selected. Other early entries into this year’s draft include Arizona’s Aaron Gordon (freshman) and Nick Johnson (junior), North Carolina’s James McAdoo (junior), Kansas’s Andrew Wiggins, Michigan’s Nik Stauskas (sophomore) and New Mexico’s Alex Kirk (junior). The big announcement by the biggest Aggie should come as no big shock. After he helped put New Mexico State back on the college basketball map, Sim Bhullar's work here is done. The 7-foot-5 sophomore center from Toronto, Ontario made his long speculated decision to turn pro official on Friday after three years in Las Cruces, the past two in an Aggies uniform. If drafted on June 26, Bhullar would be the first NMSU player to hear his name called since Randy Brown was selected No. 31 by the Sacramento Kings in 1991. Interestingly enough, the Kings are now owned by Vivik Ranadive, the NBA's first Indian-born owner, which adds to the intrigue behind Bhullar's decision. If he were to stick on a NBA roster as a second-round pick or an undrafted free agent, it's widely believed he would be the first player of Indian heritage to play in the NBA, which could tie a franchise and the NBA to a population of over 1 billion people. Thanks to @SimBhullar2 for his years in the Crimson & White. Once an Aggie always an Aggie! Don't forget about Cruces! @SimBhullar2 Wish you all the best! Always a part of #Aggie family! @SimBhullar2 @jassanch: @SimBhullar2 going to miss you in cruces. 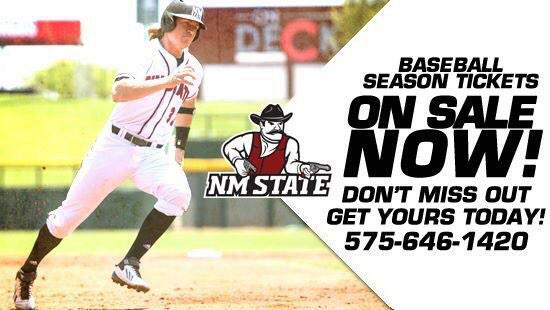 Represent #NMSU well. Good luck in the draft. Good Luck Sim! You will Always be an Aggie!